On this page you can find a description and source code of computational models of the hippocampus, the broader medial temporal lobe and memory systems, the eye movement system, and of strategy analysis for the Weather task (models are, in a sense, data analysis tools too). Meeter et al. (2004) proposed a detailed model of the hippocampus proper that focused on the dynamics of acetylcholine. It was suggested previously by Hasselmo and colleagues that there are two models in hippocampal functioning: a storage mode in which information is stored without interference from retrieved old knowledge, and a retrieval model in which old memories are activated but new ones not laid down. Shifting between these two modes might be under the control of acetylcholine levels, as set by an autoregulatory hippocampo-septo-hippocampal loop. The model investigated how such a mechanism might operate, taking into account the major hippocampal subdivisions, oscillatory population dynamics and the time scale on which acetylcholine exerts its effects in the hippocampus. The model assumes that hippocampal mode shifting is regulated by a novelty signal generated in the hippocampus. The simulations suggest that this signal originates in the dentate gyrus. Novel patterns presented to this structure lead to brief periods of depressed firing in the hippocampal circuitry. During these periods an inhibitory influence of the hippocampus on the septum is lifted, leading to increased firing of cholinergic neurons. The resulting increase in acetylcholine release in the hippocampus causes network dynamics that favor learning over retrieval. Resumption of activity in the hippocampus leads to the reinstatement of inhibition. In a later paper, Meeter et al. (2006) adressed the effects of serotonin on memory and the hippocampus within the same model. In schizophrenia, the largest cognitive impairment is usually found in episodic memory. The cause of these deficits is unclear. They do not seem to be related to so-called positive symptoms (e.g., delusions), but they also do not correlate well with negative symptoms. Talamini et al. (2004) proposed that episodic memory impairments in schizophrenia originate from reduced parahippocampal connectivity. They developed a abstract medial temporal lobe model that simulates normal performance on a variety of episodic memory tasks. The effects of reducing parahippocampal connectivity in the model (from perirhinal and parahippocampal cortex to entorhinal cortex and from entorhinal cortex to hippocampus) were evaluated and compared with findings in schizophrenia patients. Alternative in silico neuropathologies, increased noise and loss of hippocampal neurons, were also evaluated. In the model, parahippocampal processing subserves integration of different cortical inputs to the hippocampus and feature extraction during recall. Reduced connectivity in this area resulted in a pattern of deficits that closely mimicked the impairments in schizophrenia, including a mild recognition impairment and a more severe impairment in free recall. Furthermore, the "schizophrenic model" was not differentially sensitive to interference, also consistent with behavioral data. Neither increased noise levels, nor a reduction of hippocampal nodes in the model, reproduced this characteristic memory profile. 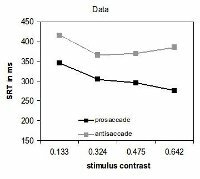 Talamini and Meeter (2009) followed up on the orignial paper by showing that it can also explain deficits in context processing, and later corroborated a prediction made by the model in patients with first-episode schizophrenia (Talamini et al, 2010). Meeter et al. (2010) presented a model of the eye movement system in which the programming of an eye movement is the result of the competitive integration of information in the superior colliculi. This brain area receives input from occipital cortex, the frontal eye fields, and the dorsolateral prefrontal cortex, on the basis of which it computes the location of the next saccadic target. Two critical assumptions in the model are that cortical inputs are not only excitatory, but can also inhibit saccades to specific locations, and that the superior colliculi continue to influence the trajectory of a saccade while it is being executed. With these assumptions, we accounted for many neurophysiological and behavioral findings from eye movement research. Interactions within the saccade map are shown to account for effects of distractors on saccadic reaction time and saccade trajectory, including the global effect and oculomotor capture. In addition, the model accounts for express saccades, the gap effect, saccadic reaction times for antisaccades, and recorded responses from neurons in the superior colliculi and frontal eye fields in these tasks. Later, we showed how this model can account for saccades that deviate away from distractors, which could until then only be explained through implausible assumptions about inhibition (Kruijne et al., 2014). What is the time course of visual attention? Attentional blink studies have found that the second of two targets is often missed when presented within about 500 ms from the first target, resulting in theories about relatively long-lasting capacity limitations or bottlenecks. Earlier studies, however, have reported quite the opposite finding: Attention is transiently enhanced, rather than reduced, for several hundreds of milliseconds after a relevant event. Olivers and Meeter (2008) present a general theory as well as a working computational model which integrate these findings. There is no central role for capacity limitations or bottlenecks. Central is a rapidly responding gating system (or attentional filter) that seeks to enhance relevant and suppress irrelevant information. When items sufficiently match the target description, they elicit transient excitatory feedback activity (a "boost" function), meant to provide access to working memory. 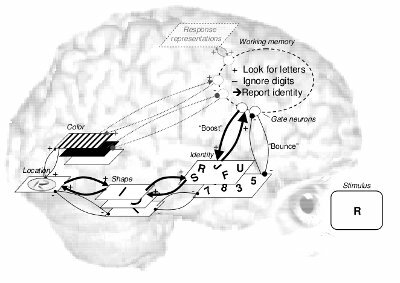 However, in the attentional blink task, the distractor after the target is accidentally boosted, resulting in subsequent strong inhibitory feedback response (a "bounce"), which in effect closes the gate to working memory. The theory explains many findings that are problematic for limited-capacity accounts, including a new experiment showing that the attentional blink can be postponed. Paper that describes the model. Why does the brain contain more than one memory system? What's the relation between all these systems? Meeter et al. (2004) do not give much of a rationale, but their computational model of memory-oriented brain regions contains some organizing principles. They dinstinguish between a hierarchy of episodic memory systems, in which the main difference between stores is the level of integration of representations: from single stimuli in the cortex to integrated represations of the whole situation in the hippocampus. These stores are inputs to a number of output regions that themselves store associations between imputs and behavioral responses, such as with fear responses in the amygdala. In Meeter et al. (2004), findings from classical conditioning are analyzed within the model. It describes how a familiarity signal may arise from parahippocampal cortices, giving a novel explanation for the finding that the neural response to a stimulus in these regions decreases with increasing stimulus familiarity. Recollection is ascribed to the hippocampus proper. It is shown how the properties of episodic representations in the neocortex, parahippocampal gyrus and hippocampus proper may explain phenomena in classical conditioning. 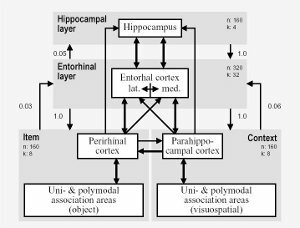 The model reproduces the effects of hippocampal, septal, and broad hippocampal region lesions on contextual modulation of classical conditioning, blocking, learned irrelevance, and latent inhibition. In a later paper (Meeter et al, 2009), genetic algorithms to investigate the complexity of memory. 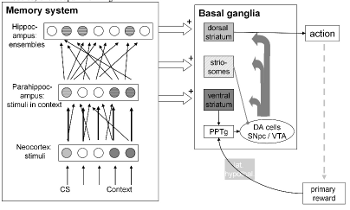 Model animals were constructed containing a dorsal striatal layer that controlled actions, and a ventral striatal layer that controlled a dopaminergic learning signal. Both layers could gain access to the Meeter et al. 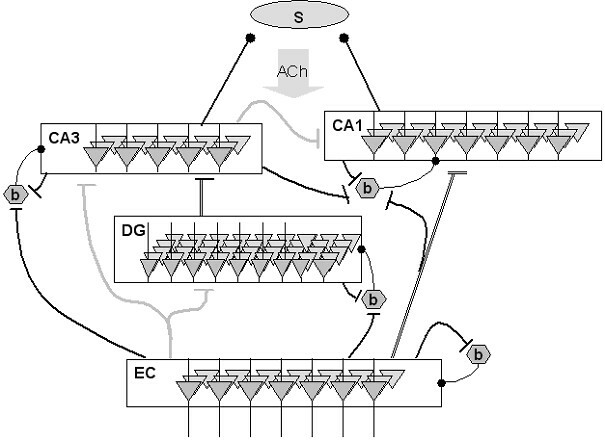 (2004) memory hierarchy, but such access was penalized as energy expenditure. Model animals were then selected on their fitness in simulated operant conditioning tasks. Results suggest that having access to multiple memory stores and their representations is important in learning to regulate dopamine release, as well as in contextual discrimination. For simple operant conditioning, as well as stimulus discrimination, hippocampal compound representations turned out to suffice, a counterintuitive result given findings that hippocampal lesions tend not to affect performance in such tasks. However, there is in fact evidence to support a role for compound representations and the hippocampus in even the simplest conditioning tasks. The "weather prediction" task is a widely used task for investigating probabilistic category learning, in which various cues are probabilistically (but not perfectly) predictive of class membership. This means that a given combination of cues sometimes belongs to one class and sometimes to another. Prior studies showed that subjects can improve their performance with training, and that there is considerable individual variation in the strategies subjects use to approach this task. Strategy analysis of probabilistic categorization attempts to identify the strategy followed by a participant. Monte Carlo simulations show that the analysis can indeed reliably identify such a strategy if it is used, and can identify switches from one strategy to another (Meeter et al, 2006). Analysis of data from normal young adults shows that the fitted strategy can predict subsequent responses. Moreover, learning is shown to be highly nonlinear in probabilistic categorization. Analysis of performance of patients with dense memory impairments due to hippocampal damage shows that although these patients can change strategies, they are as likely to fall back to an inferior strategy as to move to more optimal ones (Meeter et al, 2008). Strategy analysis can be done in excel with the file below. Matlab code is also available upon request.